FedEx Express and Intermec Technologies Corp. have teamed to develop a new dispatch system designed to capture accurate information about package pickup and delivery operations in real time, the companies announced today. FedEx initially will deploy the system to couriers in China. The new system, called GPRS-Dispatch, combines software developed by FedEx’s GSP Technologies group and Intermec handheld computers with integrated GPRS wide-area radios. 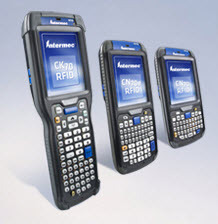 The real-time data collection and communications capabilities of the Intermec 760 mobile computer, which was customized for FedEx, allow the company to improve pickup time, enhance customer service, and increase the efficiency of its operations. The Intermec 760’s three integrated communications options – local area, wide-area and BluetoothTM– along with its ability to integrate bar code scanning, 2-D imaging and its extended battery life, were key factors in the selection. Accurate route and load planning is essential to the success of FedEx China’s operations. The 760’s wide-area networking capabilities provide instant two-way communications between courier and dispatcher, which reduces the amount of downtime a courier experiences while in-route. These enhancements to FedEx’s operations help the company to reduce transit times and ensure on-time delivery, directly benefiting its customers.